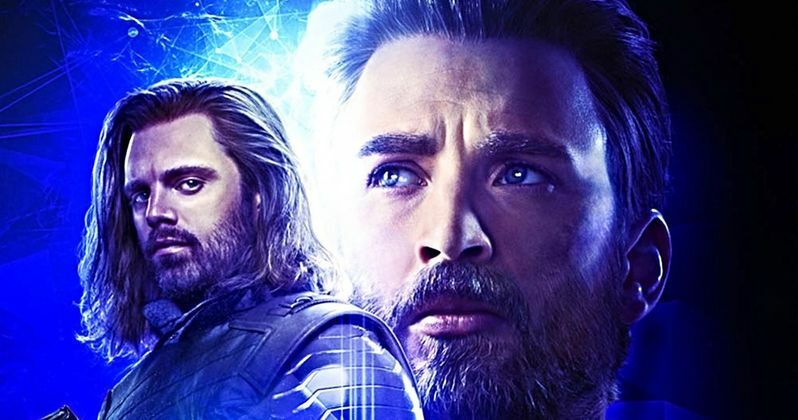 Just released Infinity War concept art shows the original designs for Steve Rogers and Bucky Barnes. The duo's friendship goes way back, and they were finally fighting side-by-side in the latest Avengers film, only to have it all taken away with a simple snap of the fingers from Thanos. Barnes disintegrated right in front of Steve Rogers, like half of the universe. Avengers 4 will reveal how everything pans out in the end for Rogers and Barnes. However, it isn't clear how their stories will end at this time. Marvel's Avengers: Infinity War - The Art of the Movie book doesn't come out until November 6th, but some interesting pictures of Captain America and The White Wolf have leaked online ahead of the release. As it turns out, Marvel Studios was planning the Nomad look for Rogers at the very beginning, with an even longer beard than what we ended up seeing in the film. Additionally, it looks like his suit was going to be nearly unrecognizable from what we've seen before, which makes sense since he was on the run and working in secret. As for Bucky Barnes, the concept art looks pretty similar to what we saw in Infinity War. He is shown with his new Wakandan arm and his suit looks relatively the same. However, the big change is his hair length. In the concept art, Barnes has a short cut, which is much different from his long hair that is featured in the film. Another piece of concept art showing Spider-Man's rescue of Doctor Strange is also featured in the new pictures and it shows the Outriders. The Outriders did not appear in the final cut of the movie, so it's cool to see the original look of the scene. It's always interesting to see concept art from movies after they hit the screen. Captain America would have had a pretty different look for at least part of Infinity War, had this concept art been used. Now, we just have to figure out how Cap and the surviving members of the Avengers are going to go up against Thanos for a second time. We've seen pictures from the set of Avengers 4, and time travel seems to be the key component that will tie everything together. As for Bucky Barnes, he'll also be appearing in a Winter Soldier and Falcon TV series for the Disney streaming platform. It was revealed earlier this week that Malcolm Spellman has been tapped to write a series featuring the two superheroes, though Marvel Studios and Disney have yet to comment on the new show. It has also been reported that Loki and Scarlet Witch are getting their own shows as well. While we wait to see how everything works out for Steve Rogers and Bucky Barnes, you can check out the Infinity War concept art below, provided by the The Marvelous Realm Twitter account.